Appearing in 1956 as a student model, the Fender Duo Sonic was a step up from its stable mate, the single pickup MusicMaster. These were short-scale guitars, sometimes called “3/4 size”, in scale lengths of 22.5 or 24 inches. 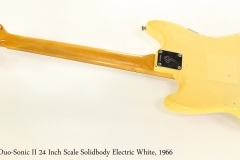 In 1964, the model was revised as the Duo Sonic II, with strong references to the new-ish Mustang, but without the trem bridge. The Fender Mustang won out in the end, and the Duo Sonic went out of production in 1968. 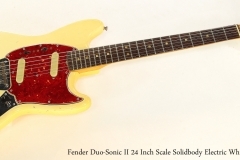 The Fender Duo-Sonic and Duo-Sonic II featured a pair of single coil pickups, but in a silent advancement, one was RWRP – Reverse Wind, Reverse Polarity – so that with both pickups on, a humbucking effect was achieved. This Fender Duo Sonic II dates to 1966 with Rosewood fingerboard and is in all original, good working order. It carries its original White lacquer finish, which has aged, worn, and yellowed to a lovely patina. It goes well with the original faux-tortoise pickguard. Fretwear is moderate. When we see these guitars now, they are used by experienced players rather than the beginners they were aimed at. Because of the short scale length, many of these players choose to use heavier strings, which work very well. This guitar comes with a rectangular hard shell case typical of the period.